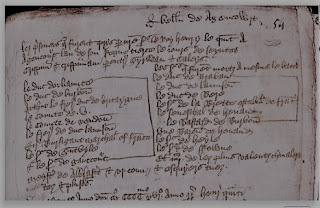 The Family Connection: Gilbert de Munnines of Poitiers, France; Is he a Mythical Ancestor? Gilbert de Munnines of Poitiers, France; Is he a Mythical Ancestor? 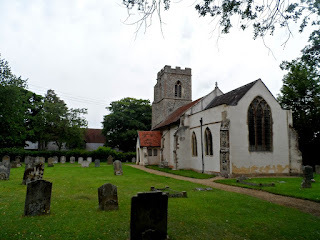 I have recently been writing about my Winthrop ancestors from County Suffolk, England the last of whom, Elizabeth Winthrop, married Humphrey Munnings in about 1588. My research into the Munnings family quickly led to an amazing pedigree stretching back to a 15th century Frenchman named Gilbert de Moonines, who was from Poitier. Almost every family tree on ancestry.com has this lineage as well as most internet family sites, oh boy you should know what comes next. Giant red flags are waving everywhere on this one, is it true, is it provable, is there any documentation? Let's see what I can find. Let's start with the family tree as suppposed laid out in 1615 in something called the MSS 5523. This is a manuscript said to contain information related to the pedigree and arms of the gentry of Suffolk. It is at the Bodlien Library of Cambridge University in England. Maybe someone can pop by and give it a peek. This Munnings Family pedigree has been printed in various books written about the Winthrop family and also families in Suffolk, England, including Muskett's Evidences of the Wintrops. It is fleshed out with details about the men and their lives. All information about the ancient Munnings family comes strictly from this pedigree. As far as I can find there is no contemporary documentation, as in the time in which they lived, on the family from any other source, there are no records of them in France, in England, in the service of the Dukes of Suffolk, etc. There are no records of births, marriages or deaths until it gets to the fifth generation. If you know of any documents that exist, I would love to hear from you. Not much is written about Gilbert in this family pedigree. He is said to be from an ancient family of Poictiers, Fraunce, which I am guessing is supposed to Poitiers, France. His wife's name was Charlotta. Nothing more. (Can I quickly point out that the name Charlotta/Charlotte was not in use until the 17th century, some three hundred years after this Charlotte's birth.) Back to my story. A search of ancestry.com and the web tells a different story. Gilbert is given a birth year of 1360, marriage to Charlotta in 1384 and a year of death of 1459 at the grand old age of 99. Some even say he died in Nedgings, Suffolk. Charlotta is given a date of death of 1463, in France. Some tree owners have deduced that Gilbert was named for his father. This older Gilbert is said to have been born in 1320 and died on 26 August 1346 at the Battle of Crecy. Hummm. I wonder how they figured that out. Not to mention the fact that that a man who died in 1346 cannot possibly be the father of a son born in 1360. Gilbert and Charlotta had at least two sons, according to the pedigree, the oldest was Anthony and the second was Olyver. 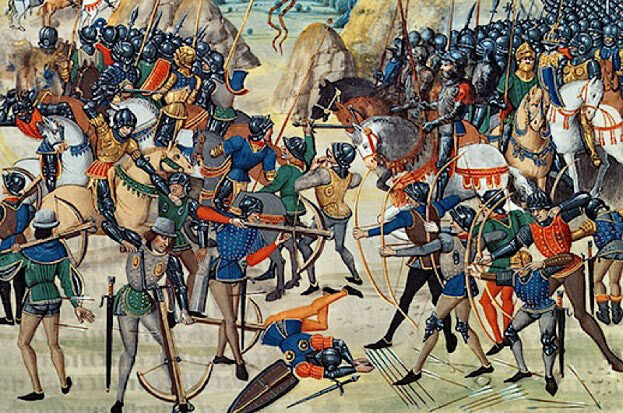 Both men fought at and were taken prisoner at the Battle of Agincourt on 15 October 1415. Anthony was ransomed, both men swore fealty to King Henry 5th of England and were given their liberty after promising to help him fight in all his French Wars. Olyver married an Englishwomen named Isabella, they had two daughters who died young. He himself, died in 1424 at the Battle of Verneuil in France. Anthony served under the Earl of Suffolk, William de la Pole, later Duke of Suffolk, at the siege of Orleans. Growing tired of war he retired and died in 1443 leaving only one son, Henry. This would mean that Anthony died sixteen years before his father and twenty years before his mother, at least if you believe ancestry.com and wikitree and geni. Okay, so what can you find about these two brothers on ancestry.com? Anthony has been assigned a birth year of 1386 and Oliver 1390. Oliver is really of no consequence as he had no descendants. So let's just concentrate on Anthony. 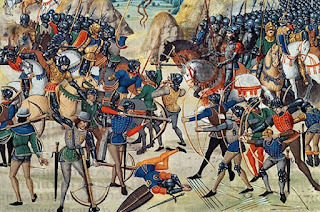 the Battle of Agincourt, one of the great battles of the Hundred Year's War between England and France, took place on St. Crispin's day, 15 October 1415. France was, at that time, fractured by infighting. The King of France, Charles VI, was mad, and by mad I mean crazy. The King's nephew, Charles Duc de Orleans and the Armagnacs and John, the Duke of Burgundy were fighting for control of the mad king and France. Although France was torn by these factions, news of the landing of King Henry of England with his army on French territory united the nobles. The Oriflamme, the legendary battle standard of the Kings of France, was taken from the cathedral of St. Denis and used to rouse the 'call to arms'. The Burgundians and Armagnacs may have hated each other, but they all hated the English. The battle was an overwhelming victory for the English. Thousands of french knights and noblemen were slaughtered, estimates range from 7,000 to 10,000 french dead. A late arrival to the fight, the Duc de Brabrant, younger brother of the Duc de Burgundy, started a rally of the failing french army and actually came close reaching King Henry. Fearing that the thousands of french prisoners might overpower their guards and rejoin the fight, Henry ordered that they be killed immediately. Some were in a church which was set on fire and other just had their throats cut. Only the most valuable prisoners were kept alive for their ransom, their number is estimated to be around 1,500. So, if the story is to be believed, Olyver and Anthony fight against the hated English who are trying to take over their country. They survive the battle and are deemed of sufficient rank and wealth to take as prisoners. They were brought to England, their family paid their ransom and then they did something very interesting. Despite, their father being killed by the English, and witnessing the wholesale slaughter of their peers, their country ravaged by maurading English Knights and the crown taken by and English King, they turned traitor to their country and family. They turned their back on their friends who died a brutal death at the hands of their enemy and swore not only allegiance to an English King but that they would join him in fighting their own people. I do not believe that for a second. Anthony, if this story is to believed, took employment with William de la Pole. William lost his father to dysentery at the siege of Harfleur, and his oldest brother was one of the few English knights killed at Agincourt. There was likely no love lost between William and the French. William became the 4th Earl of Suffolk upon his brother's death. He was a life long soldier, spending more than 20 years fighting in France. William was co-commander of the English forces holding the French city of Orleans in 1429. 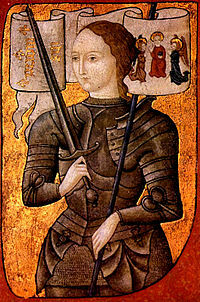 The city was liberated by the French, led by Joan d' Arc, and William was forced to retreat to the city of Jargeau, where he surrendered in June of 1429. He was held prisoner for three years and was finally ransomed and released in 1431. Anthony, it is said, was taken prisoner with him, I wonder who paid his ransom this time. A French Knight fighting against his own people, I don't think that would have gone down well. After Orleans and Jargeau, Anthony growing old and tired, he was 44, left the service of William de la Pole and retired. He had at some point in time married and had only one child, a son named Henry. This Henry was trained for service and was also in the employment of William de la Pole. Although there is no record of this marriage and his wife's name is unknown, the good folks at ancestry.com have assigned him a marriage to Lady Munning in 1405 in Poitier, France. She has also be given a year of birth of 1390 and a year of death of 1464. How this information was obtained is a mystery. Anthony, the pedigree tells us, died in 1443, where he died is not mentioned, but most ancestry.com members assume it was in Suffolk, and at least one tree says he died in Woolpit of all places. Anthony's only son, Henry, was also in the employ of William de la Pole, he did work for him in France. The pedigree does not mention when or where Henry was born, but once again turning to the internet we learn that he was born in 1408 in France. Henry married in England, according to the pedigree, to Elizabeth daughter of Thomas Charles of Kettleborough. Now here at last is a name which we can find in records. Sir Thomas Charles of Kettleburgh was the son of Richard and Anne Charles. He married Alice Ramsey, daughter of Ralph Ramsey, Esq. of Kenton. They had at least one son, also named Thomas. 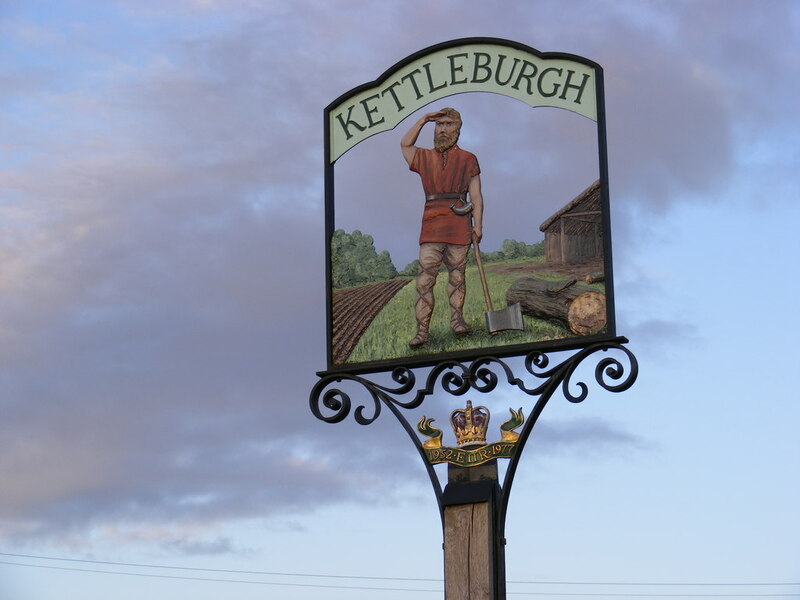 Sir Thomas had multiple land holdings in both Suffolk and Norfolk County including the manor of Kettleburgh. Thomas Sr. died on 11 December 1418, his son and heir was more than 15 at that time. Thomas Jr. and his wife Elizabeth conveyed most of their estate to John Mowbray, Duke of Norfolk in 1448. Alice his mother remained in control of much of the estate while she lived and she conveyed Kettleburgh Hall on Simon Brook of Easton and his heirs. No mention is made of any other children and no marriage settlement was made to a daughter Elizabeth. Hum, disappointing. William de la Pole was made the 1st Duke of Suffolk in the year 1448 but in 1450 he was banished, suspected of traitorous dealings with the french. He was killed as he tried to make his way to France. His son John, became the 2nd Duke of Suffolk. The pedigree tells us that after William's death, Henry returned to Suffolk, content to live in a "mean condition", mean meaning poor. He worshiped regularly at the shrine of St. Edmund. 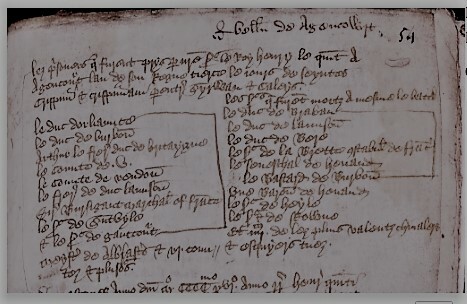 He died in 1478 (for some reason known only to themselves my friends at ancestry say he died on 19 Dec 1468, but this is the probate date of the will of Henry Monnyng of Norton near Woolpit part of an extended Mannyng/Monnyg family). [ He left 3 children, Jean, Jaques and the unusually named Gundreda. Gundreda is an old Norman name and was the name of William the Conquerors daughter. It is rarely found in records and would he a highly unusual name for a girl born in England in the 15th century. Jaques, her brother, died rather predictably without issue, this seems to happen to a lot with this family for some reason. 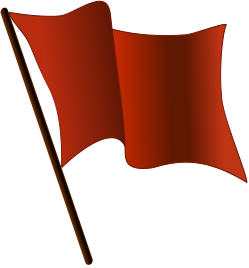 Gundreda's husband is known only as Knighton and no children were mentioned. John, who now goes by the surname of Moounines, followed in his father and grandfather's footsteps and worked for the de la Pole family in Suffolk. The pedigree states that John was granted the lease of the manor of Nedging by the Duke of Suffolk for his services. Unfortunately John de la Pole, 1st Earl of Lincoln, son of the Duke, choose the wrong side in the battle of the Roses and was killed at the battle of Stoke in 1487. All the de la Pole's lands were returned to the crown. The pedigree says that John married Margaret, the daughter of Henry Woodwarde. Henry Woodwarde's arms are "barry of six, or and sable and a canton of gules." This is not true. Those arms belonged to a member of the Woodward family that orginated in Staffordshire and became London Grocers in the late 1500's and their son eventually were called Gentlemen. John and Margaret, we are told, had several children, including son Henry, daughter Katherine who married John Woorliche and a daughter Anne who married Sir Clement Higham. The pedigree gives no date of birth or death for this John but according to ancestry and the web he was born circa 1430 and died on 24 April 1486, once again this is the date of probate for a different man, John Munnying of Norton, this is a different Munning family. And, even more importantly, there is a gross error in the naming of his children. Thomas was a wealthy land owner in Bury St. Edmunds, he had property in Whepstead, Fornham all Saints and Hengrave. His parents, whom he named in his will were John and Maryon Munnings. He and his two wives produced five daughters, and no sons. He wrote his will in August of 1540 and died shortly afterwards. Anne was born around the year 1500, she married Sir Clement Heigham and died before her father. Her husband was Speaker of the House of Commons during the reign of Queen Mary. He and Anne's father "Thomas Mounning" were appointed "keepers of the park at Chevington" by the Abbey of St. Edmunds. He held the lease on various manors in Suffolk including Semer Hall. Queen Mary granted him Nedging Hall in honor of his support of her and her right to the throne. Mary was on the throne from 1553 to 1558. There multiple Munning families in Suffolk and it is impossible for all of them to be descendants of the de Moonines brothers. And there were Munnings already living in Suffolk prior to the supposed arrival of the Moonines. Robert Munnings is recorded in 1321 and a Stephen Munning in 1336. I personally do not believe the story about them being French prisoners of the battle of Agincourt. Nothing in this pedigree is provable until you get to Henry and Alice Pye. It is a charming story but there is not documentation to back up any of it. In fact it contains some glaring errors. And it's not just me who doubts it. Respected genealogist John Brooks Threlfall believes it to be a family fable. See his article in The American Genealogist. One last thought on the information that is found on ancestry.com. I see that in quite a few trees the Munnings men are given the title of Sir. In order to be addressed as Sir a man has to be at least a Knight. A mere gentleman is addressed as Mr. There is nothing to indicate that any of the Munnings had been knighted. Dr. Reme Ambuhl, "How Many French Prisoners Survived the Masssacre Which Took Place at the Battle of Agincourt," Agincourt 600 (http://www.agincourt600.com : accessed 24 December 2016). Stephen Cooper, Agincourt Myth and Reality 1915-2015, (Barnsley, Yorkshire: Praetoriam Press, 2014). "Inquistion Post Mortem, Thomas Charles, Knight, Writ 203, 24 January 1419," Mapping the Medieval Countryside (http://www.inquisitionspostmortem.ac.uk/view/inquisition/21-203/205 : accessed 26 December 2016). Heir is son Thomas 15+ years old. Vincent Borough Redstone, Calendar of Prereformation Will, Testaments, Probates Administrations; Registered at the Probate Office Bury St. Edmunds, (Ipswich: W. E. Harrison, 1907). Sir Henry St. George, The Visitation of London Anno Domini 1633,1634 and 1635, Vol. 17, (London: , 1883) 367 and 368. and William Ryley and Henry DeThick, The Visitation of Middlesex begun in 1663, (London: J. Nichols). John Brooks Threlfall, "The Munning Ancestry of Thomas Bradbury," The American Genealogist, Vol. 55, p. 151.